We’ve also published a slower, more traditional fish fumet recipe that can be fortified (how to fortify fish fumet). Fish fumet is variation on fish stock that is more strongly flavored, and traditionally used as a poaching liquid for seafood dishes. At its most basic, it’s simply fish stock with the addition of white wine, however the below version contains ginger, citrus peels, and leeks, which all add additional flavor. 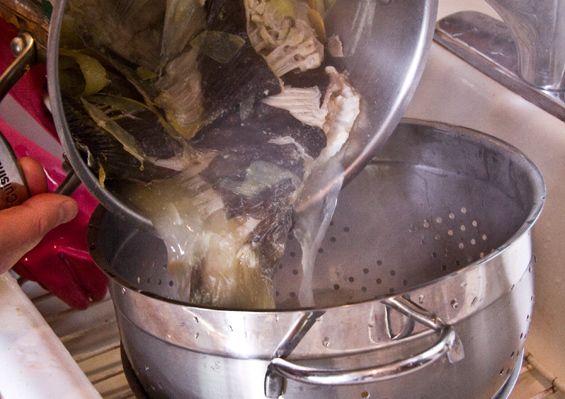 Because it’s a stock, be sure to follow the Cardinal Rules of Stock Making (although if you’re using the finished fumet right away rather than storing it for later, you don’t have to follow rule 6, just use it hot). 1. Wash, peel, and rough chop the carrot. Wash and chop the celery ribs. 2. 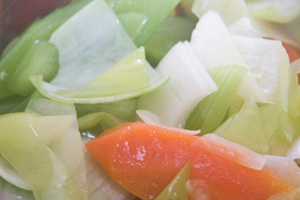 Remove the tops and bottoms of the leeks. Cut leeks into three inch sections. 3. Cut into each section halfway in with a knife 2 or 3 times. This opens the inner leaves up so you can get any in-grown dirt out. Wash thoroughly under running water. Rough slice on a bias. 4. Wash the orange. Peel the orange zest off in large strips using a vegetable peeler. Do the same with lemon. 5. Peel the ginger and slice it into thick disks. 5. Add olive oil to a stock pot, throw in all the vegetables at once. Sweat the vegetables (no color) until translucent. 6. Add the wine to the pot, and bring it to a simmer. Add the fish bones, bay leaf, ginger, and citrus zest. Add enough water to almost cover the ingredients. 7. Bring the water to a simmer. Be sure to skim the surface periodically to remove the particles that float up. 8. Simmer the fumet for ½ hour-1 hour (longer is better). 9. Strain with your finest strainer (if this is too small, use a colander or large strainer to strain out large pieces, then run through the smaller strainer to finish). If you still see particles and would like clearer fumet, strain again through cheesecloth. 10. Use immediately or save for later. If saving your fumet for later, try to cool it down as quickly as possible by surrounding the pot with ice water before putting it in the fridge. It will last for two or three days. If you would rather freeze your fumet, it will last for several months in the freezer (be sure to label it with the date you made it!). Fish fumet is extremely versatile and can be used to poach white fish like halibut fillets or black cod fillets, shellfish like manila clams or Mediterranean mussels, or even pink salmon fillets.